See that picture up top? That's a pretty healthy looking breakfast. My breakfast doesn't look like that right now most days, but I'm still hoping one day it will. I'm five weeks into my food tracking diary and I'm not feeling like that big miraculous change is going to hit and I'm going to pay more attention to what I eat. Last week was my second and final week living with Jawbone's fitness trackers and app. Well, let's just say app, because none of my Jawbones wanted to spring back to life again. Disgruntled owners, I feel your pain. Putting the hardware fails to one side, I could feel my motivation starting to slip again, particularly when it came to logging my meals on time. On a couple of days I decided to make a note of my meals before going to add it into the app as reminders to myself. I did that for two days running but what I didn't realise was that at times I couldn't go back to those previous days and log my meals for some reason. Tres annoying. It felt very similar to that feeling when you were really proud to hit that 20,000 step mark only to look down at your fitness tracker and see that it's run out of battery. In a way maybe it was a good thing, the fact that I felt that disappointed and annoyed that I didn't have that data to pore over or for Jawbone to crunch the stats. I discovered that I could set up reminders, something that apparently you can do in MyFitnessPal (thanks to the reader who pointed that out) but is clearly a lot harder to locate on the Under Armour-owned app. In the Jawbone app, it's a whole lot easier to find, so I set up three daily reminders to nudge me to log meals - and it worked. So there was a solution of sorts. What I really like about Jawbone's approach is the smart coaching, something I spoke a bit about in week 4. Initially, I didn't really feel like they were radically changing my mindset, but in reflection it was actually doing it a more subtle way. On a couple of occasions when I was making some lunch I decided to pick out different items based on what had popped up in my daily Smart Coach instalment. It was a similar situation when I went to do my food shop; I was starting to consider different items. I just wish there was more of this kind of useful information to balance out the chore of logging. 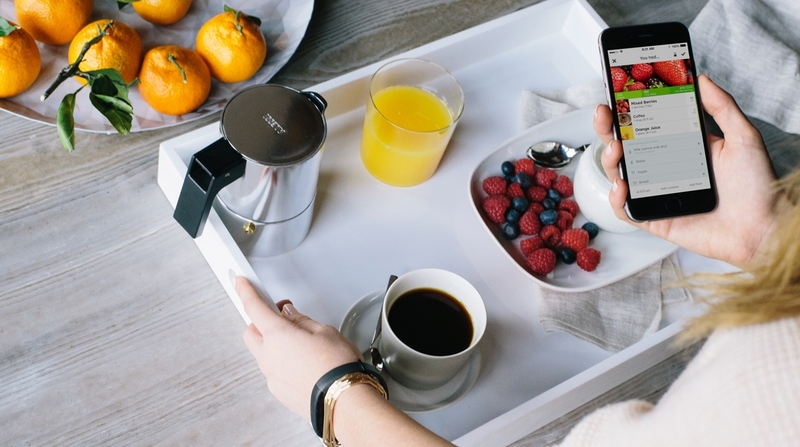 So what have I learned from my two weeks of food tracking with Jawbone's ecosystem? Let's start by saying that the hardware is pretty much a disaster. While I did have to face many of the same obstacles with regards to estimation of portions and not really being able to effectively log meals, it proved that the simple approach does work. Yes, it's great to have a lot of data, but it's also good to present the data that the average user can really make sense of. Food scores and interesting nutritional trivia were the highlights, but not always being able to log some of my meals at a later date wasn't great. After five weeks, it's clear that this still so much more to do around guidance. While I'm pretty comfortable crunching fitness data, the food information is an entirely different ball game and I hope it will get easier over the coming weeks. This week it's time for Fitbit to step up to the plate as I find out what the biggest name in wearable tech has got to offer in the way of food tracking. I'm going to be starting out with the Fitbit Flex 2 around my wrist but I'll be moving up to the more advanced Fitbit Charge 2 the following week to see whether the extra sensors on board can make a difference. I've also been chatting to the folks at Fitbit who look after all things health and nutrition to talk about the company's approach to food tracking and get some tips to help me stick with it. I'm definitely going to need it.